Director Kiran Rao, who has been sending hand-written post-cards to invite the media to a screening of her directorial debut "Dhobhi Ghat", says in many ways the movie is about her and her life in Mumbai. "It is a film about four people and the city of Mumbai - four ordinary people whose lives intersect and become forever altered as they journey through longing, loneliness, loss and love... And in many ways it is a film about me, the people I've met and the life I've lived in this crazy city," Rao wrote in one of the postcards. 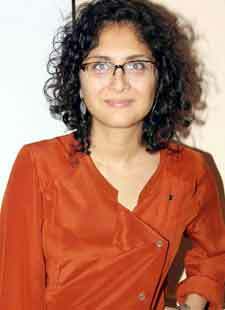 Just like her actor-filmmaker husband Aamir Khan, Kiran has also come out with an unique way to promote "Dhobi Ghat". She is sending postcards with information about "Dhobi Ghat" and herself to friends and media. The first one came out Nov 17. Kiran says Mumbai is more than just a city for her and there is something special that pushed her to make the film, which is scheduled for a Jan 21 release next year. "I came to Mumbai 12 years ago, moved house seven times and worked on eight films, found love and am seeing my dreams come true. I think it's the magic of Mumbai, my muse, my home and the season I made this film called 'Dhobi Ghat'," Kiran, who tied the knot with Bollywood star Aamir in 2005, wrote in the first postcard. Her movie stars Aamir, Prateik Babbar, Monica Dogra and Kriti Malhotra and she says the city of Mumbai also plays a role in her movie. "Mumbai is the fifth character in my film and I wanted to portray it in all its vibrancy and complexity," she wrote.